XML, or the Extensible Markup Language, is a standard or set of rules that governs the encoding of documents into an electronic format. XML goes hand in hand with HTML in internet usage. XML defines the structure of the document, but not the way the document is displayed; this is handled by HTML. XSD stands for XML Schema Document, and is one of the several XML schema languages that define what could be included inside the document. An aspect of XSD that people find to be one of its strengths, is that it’s written in XML. This means that users who know XML are already familiar with XSD, eliminating the need to learn another language. 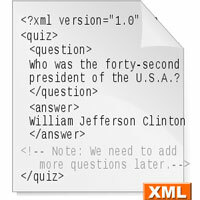 XML does not define any elements or tags that are usable within your document. You can create any tag to describe any element on your XML document, as long as you follow the correct structure. An XSD defines elements that can be used in the documents, relating to the actual data with which it is to be encoded. Another positive aspect of having defined elements and data types, is that the information will be properly interpreted. This is because the sender and the receiver know the format of the content. A good example of this, is the date. A date that is expressed as 1/12/2010 can either mean January 12 or December 1st. Declaring a date data type in an XSD document, ensures that it follows the format dictated by XSD. As an XSD document still follows the XML structure, it is still validated as an XML document. In fact, you can use XML parsers to parse XSD documents, and it will perform flawlessly, and produce the right information from the file. The reverse is not necessarily true, as an XML document may contain elements that an XSD parser may not recognize. XML only checks how well-formed the document is. This can be a problem, as a well-formed document can still contain errors. XSD validating software often catches the errors that XML validating software might miss. 1. XSD is based and written on XML. 2. XSD defines elements and structures that can appear in the document, while XML does not. 3. XSD ensures that the data is properly interpreted, while XML does not. 4. An XSD document is validated as XML, but the opposite may not always be true. 5. XSD is better at catching errors than XML. Ben Joan. "Difference Between XML and XSD." DifferenceBetween.net. July 27, 2011 < http://www.differencebetween.net/technology/difference-between-xml-and-xsd/ >.